Gray Gaulding picked up the 1st last-place finish of his Monster Energy NASCAR Cup Series career in Sunday’s AAA Texas 500 at the Texas Motor Speedway when his #83 Earthwater Toyota fell out with engine trouble after 159 of 334 laps. The finish came in Gaulding’s 29th series start. The youngster from Colonial Heights, Virginia was a surprise addition to the Cup Series field when he made his debut at Martinsville just over a year ago. In 2013, when he was only fifteen, he won in just his third career K&N Pro Series West race at Phoenix by spinning out current XFINITY Series regular Cole Custer on the final lap. The next year, he was third in the K&N East standings, and ran part-time in Trucks, finishing a series-best 4th at Mosport that summer. Sponsorship from Krispy Kreme followed him into the ARCA Racing Series, then the XFINITY Series, and in the latter picked up a pair of 13th-place runs for Roush-Fenway Racing. In the closing stages of Sprint’s final year as title sponsor of the Cup Series, Gaulding got his first shot of Cup Series racing. This time, he would drive for Curtis Key’s “open team,” the #30 Chevrolet campaigned for much of the year by Josh Wise. This time carrying sponsorship for the “Feed The Children” foundation, Gaulding qualified for two of his three attempts, finishing 39th at Martinsville after rear gear issues, then 37th after the fuel pump failed at Phoenix. His season ended when he was the only driver who failed to qualify for the Homestead finale. 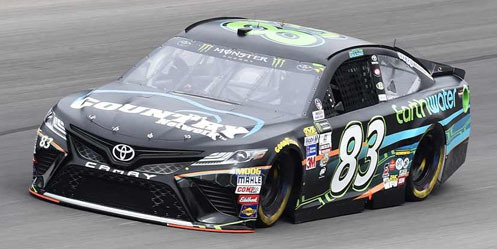 This season, Gaulding moved to BK Racing, whose all-rookie lineup would match his Chartered #23 Toyota with teammate Corey LaJoie in the “open” #83. 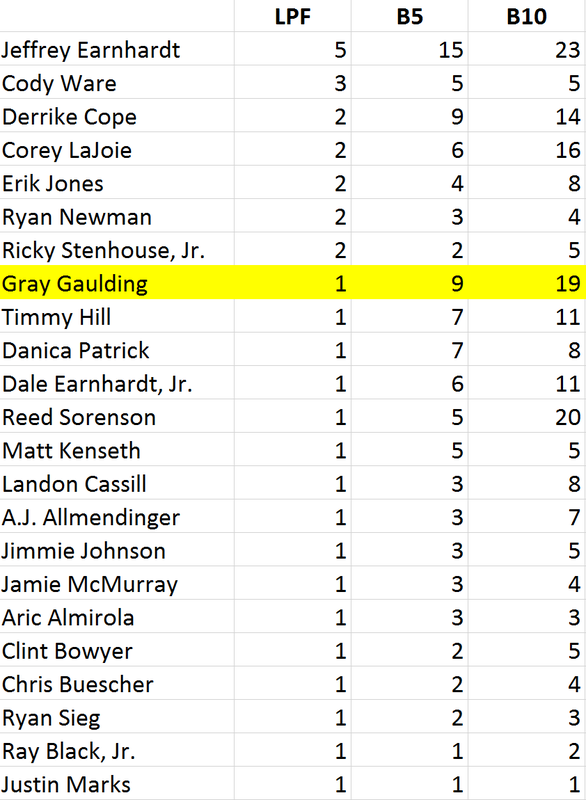 Gaulding ran no better than 29th in his first eight races of the year, while stories began to swirl about BK Racing’s financial situation. Following a 29th-place finish at Pocono, Gaulding and BK appeared to have parted ways, leaving the driver an opportunity to drive for other teams. He didn’t return to Cup competition until Kentucky, four races later, where he drove for Premium Motorsports. During the race, Gaulding’s #55 #CheckIt4Andretti Toyota almost didn’t complete a lap due to a rear end failure. The team got him back out in time to drop Jimmie Johnson to last. Eight more races for Premium would follow, the best finish of these a 24th-place showing in the crash-marred Brickyard 400. The Southern 500 at Darlington saw Gaulding and BK unexpectedly reunite, this time with him driving the #83. Unfortunately, the evening ended with a crash, then a busted water pipe above his garage stall that soaked his Toyota. He also drove for BK at Talladega, scene of what had been his best career finish to that point, a 20th in April. This time, despite suffering heavy damage to his #83 Dustless Blasting Toyota, Gaulding managed to stay among the tattered remnants of the field, earning a 9th-place finish – his first Top 10 in Cup. Following a 28th for Premium at Kansas, then a 31st for BK at Martinsville, he would run the #83 once more at Texas. This time, Gaulding’s #83 was sponsored by Earthwater, the brand which came aboard at BK at Sonoma in June to back the debut of current NASCAR Whelen Euro Series champion Alon Day, the first Israeli-born driver to start a Cup Series race. Buying space on the hood that weekend was Dallas-Fort Worth-based country music station The Country Network (TCN). Gaulding ran just nine laps in Friday’s opening practice, where he ranked 33rd of the 40 entrants, then found himself one of seven drivers held up in inspection so long that he was unable to put up a qualifying lap. The other six – Chase Elliott, Matt Kenseth, Joey Logano, Trevor Bayne, Reed Sorenson, and Corey LaJoie – outranked the #83 in Owner Points, handing Gaulding the last spot on the grid. He then ran 35th and 37th in Saturday’s final two practices. Texas turned out to be a busy weekend for Gaulding as he would be the only driver competing in all three national touring series. Premium Motorsports had expanded their use of Gaulding to driving a new second entry in the Camping World Truck Series, a truck they’d obtained in September following a merger with Tommy Baldwin Racing. Later that month, on the XFINITY Series side, Rod Sieg’s RSS Racing had Gaulding debut a third entry, a #38 Chevrolet, at Dover. Both rides have, as of this writing, been reserved for “start-and-park” duty. In the Truck race last Friday, Gaulding finished 27th, out with electrical issues after 25 laps. His XFINITY race – this time in RSS’s #93 – lasted 65 laps before a vibration left him 33rd. On Sunday, Gaulding lined up last in the field, but was soon joined by two other drivers with pre-race penalties. The first was Paul Menard, who handed Daniel Hemric the wheel on Friday when his wife Jennifer gave birth to their second child. The second was Jeffrey Earnhardt, whose #33 Hulu Chevrolet needed a transmission change. By starting the race, and with Cody Ware not in the event, Earnhardt locked-up the 2017 LASTCAR Cup Series Championship. It’s the second in a row for The Motorsports Group (now merged with Circle Sport), the same team which gave Gaulding his first Cup starts in 2016. It didn’t take long for last place to change hands. On the first lap, fifth-place starter Kyle Busch slid his #18 M&M’s Caramel Toyota into the #2 Wurth Ford of Brad Keselowski, damaging Busch’s right-front fender and cutting down Keselowski’s left-rear. Both drivers made unscheduled green-flag stops the next time by. Keselowski briefly held last, but Busch’s repairs took two laps to Keselowski’s one, dropping the #18 to the final spot. If things remained unchanged, it would have been the first last-place run for car #18 in a Cup race at Texas since J.J. Yeley’s crash in the spring of 2007. By Lap 28, cars near the tail end of the field were being lapped by the leaders, putting them on the same circuits as Keselowski and Busch. Keselowski caught them first, passing both the #51 ScubaLife Chevrolet of Ray Black, Jr. and the #33 of Earnhardt to climb his way to 37th. Black and Earnhardt fell to the same lap as Busch on Lap 32, and two circuits later Busch caught Black, moving the #51 to last for the first time. Had he finished there, Black, making his first Cup start since his debut at Chicagoland, would have become the first Cup driver to finish last in his first two series starts since Clay Rogers in 2014. Curiously, Rogers was also driving for BK Racing at the time. Gaulding first entered the last-place picture on Lap 50, when he lost laps during the opening round of green-flag stops. Jeffrey Earnhardt, looking for a season sweep of last at Texas, took his own turn on Lap 57. Then on Lap 62 came Joey Gase in the Premium Motorsports / Tommy Baldwin Racing prepared #7 DonateLifeTexas.org Chevrolet. Black retook the spot the next time by following a disastrous first stop reminiscent of the team’s struggles at Darlington. According to @NickBromberg, Black overshot his stall, had a slow tire change, then stalled. Radio communications indicated the car was having either electrical or battery problems, causing the car to shut off. The car re-fired on Lap 66, and rejoined the race seven laps behind. By the end of the race, Black would stall at least one more time, prolonging a caution, and spin out twice. Last place, however, would ultimately fall to Gaulding. According to @ChrisKnight, smoke from the exhaust pipes forced the #83 behind the wall, where he took last from Black on Lap 171. Two laps later, Black pulled into the garage, stopping in front of Gaulding’s garage stall. At this point, someone on the #83 radio said “We’re done,” and the car was pulled from RaceView. On Lap 176, Black returned to the track, now fourteen laps behind. Despite the aforementioned struggles, Black finished under power in 34th, twenty-nine laps behind race winner Kevin Harvick. Finishing 39th was Gaulding’s teammate LaJoie, who also had engine trouble on the #23 Dr. Pepper Toyota. 38th went to David Starr, back in the Cup Series for the first time since 2011, after his first turn in Motorsport Business Management’s #66 Moore Freight Service Chevrolet ended when he rear-ended another car in the late stages. 37th fell to Kyle Larson, who endured his third-consecutive DNF after a hard crash in Turn 2 that drew a ten-minute red flag. Rounding out the group was Clint Bowyer, who fell as far back as 39th due to an oil leak before he finished the race as the last car under power. 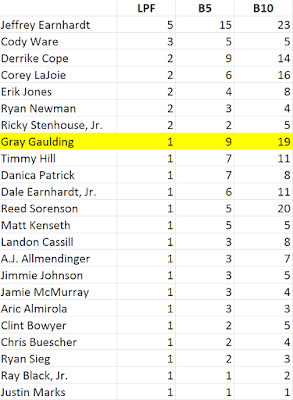 *Gaulding gives BK Racing’s #83 its third last-place finish of the 2017 Cup Series season, and is the third different driver to do so, joining Corey LaJoie and Ryan Sieg.